Yesterday I had to wind extra large skeins of yarn. The Cascade Eco Plus is 478 yards and 8.8 ounces — huge! 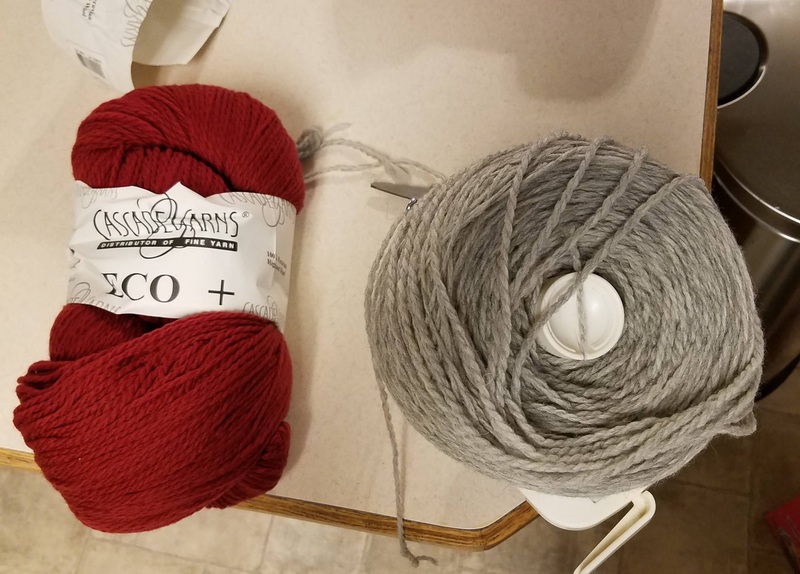 Nicole has a standard ball winder and I barely got the gray skein wound into a cake. The red one didn’t quite work and I had to wind a good bit of it by hand. They’re both wound and today I will start on the tiger hats for Addie. I had planned to have one of them done by the time she gets home from school but . . that ain’t happening since she’ll be home in less than two hours and I haven’t started it yet! This has been one of those days with too much to do and not enough time. Glad to know I’m not alone. Relax you will have it ready by Friday!! What is the advantage of taking the yarn from a skein to a ball? I’m an occasional crocheter, and I just take from the skein. I’m wondering if rewinding somehow helps the yarn lay better or if it’s just more convenient. Nice colors together, though, so worth the extra work.